At the tender age of 23, Viktor Blom has managed to catapult himself into the big leagues of poker, whilst most people of his age are just sorting out what they want to do with their lives after college. Technically a poker player for almost ten years already, the young champ first got introduced to the game at the tender age of 14 by an older brother, and he has never stopped. From there, he has gone on to win endless games and tournaments, tearing through hundreds and thousands of dollars and playing in the biggest online cash games available. Some of the stakes that he plays for would make most of our eyes water, and would no doubt turn us into a shivering wreck if we were wagering those sorts of bets, yet Viktor is one of the calmest characters in the game. 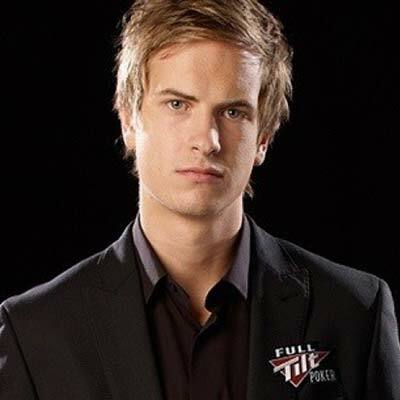 Blom, born on the 26th September 1990, grew up in Ranas, Sweden, and got most of his early poker practise playing with friends. During this time he developed his infamous aggressive no-holds-barred attitude towards the game. Whilst he was introduced to the game by his older brother, they are said to share an incredibly different style of play – Blom opting for fearless tactics, whereas, his brother utilises a more conservative, chilled out approach. He also has two sisters, neither of which have any particular interest in the game. Perhaps it’s true that there’s only enough room for one poker mastermind in every family. Under the infamous ‘Isildur1’ username, Blom slammed into the online poker spotlight in 2009. Often Jumping in at the deep end in high stakes poker games on Full Tilt Poker, with a bold tendency to confront and face poker pros with far more experience under their belt than him – and win. As a result of his early successes, Viktor managed to move away from Sweden and decided to plant himself in London – at the young age of 21. From here, he continued his online pursuits – squaring up to big league poker players such as Phil Ivey and Brian Townsend, and this was before anyone even knew who he was. Over his career thus far, Blom has managed to attain three World Series of Poker cashes, which is nothing special but is still impressive for a guy of his age. His career tournament winnings to date are $1.5 million, however this does not do him justice as he is predominantly an online cash game player, and although not trackable has no doubt taken home many millions from these nose bleed games. Isildur1 has earned his reputation through his aggressive no-holds-barred style of play and willingness to take on any opponent at any stake level. His biggest success at the World Series of Poker is a 14th place finish at the $50,000 Poker Players Championship in 2012 – where he scooped a hefty $105,235 – something that definitely ought not be sniffed at. Whilst he has managed to garner a considerable amount of money from playing online cash games, Blom only secured his first actual major title in 2012, with the 2012 EPT PokerStars Caribbean Adventure, where he dominated Dan Shack in a heads-up battle for this title. The cash prize wasn’t so bad either – just a bit of spare change: a little over one million dollars! If that wasn’t enough, he then went on to place well in a number of European Poker Tour events, winning €13,400 at EPT Deauville, then swiping a quick €10,000 by finishing 7th place in the EPT Berlin. Finally, he grabbed another 7th place finish at the EPT Grand Final in Monte Carlo, scooping another €10,000. In a recent interview, Blom expressed that he likes to spend his winnings on “nice dinners and going out with my friends” – something he can do in abundance if he maintains current winning record. He also likes to gamble with the odd game of football, which is slightly uncharacteristic for a professional poker player, who usually prefer betting on the big american sports. He cites his favourite football team as Chelsea, England – something that presumably occurred after his move to London. Who knows if he’d ever be as good a professional football player, as he is a poker player? 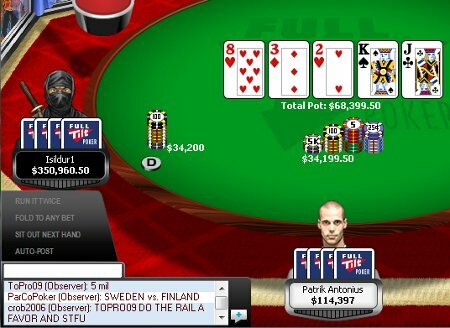 Viktor is fearless in online cash games, seen here playing against Patrick Antonius on Full Tilt Poker with hundreds of thousands of dollars at stake. Some other interesting trivia about this poker player include the fact that, whilst he has plenty of money to blow on several of them, Blom is still currently unable to drive a car. Right now, he says he prefers to spend his money on food and fine dining, but that’s only until he passes his test, when the answers will become a little different! Viktor Blom is set to continue his crazed up-and-down playing techniques for a good while to come yet, with massive downfalls all being taken in his stride, knowing that a player of his talent will recover it all back and more, as there are sure to be many more wins on the horizon for this young professional. He is a valued member of the Full Tilt Poker Professionals Teams and exclusively plays online at Full Tilt Poker. He is very often seen playing at the online tables there and you can even load up his table and watch him while he plays, chatting to him in the chat box. Just search for his nickname Isildur1 using the player search. You could even sit down and play with him, if he is playing at a stake table that you can afford (he does sometimes play at lower stakes tables to play with his fans). 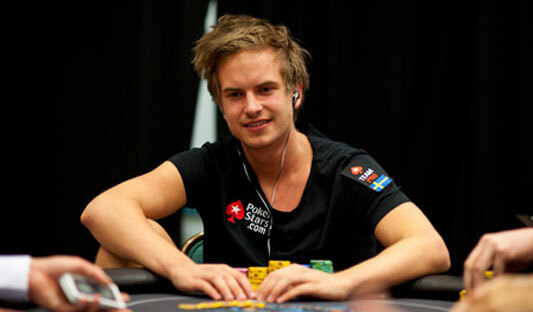 Want to Chat and Play Poker with Viktor Blom?